President Donald Trump began his Thanksgiving holiday, as he did last year, with a teleconference with members of the military around the world from his Mar-a-Lago resort in Florida. But as Trump approaches the two-year mark as president and commander in chief, he has yet to visit U.S. troops stationed in Iraq or Afghanistan in person. Speaking to the commander of Bagram Air Field in Afghanistan Thursday, he asked, "How are things going over there?" and later said, "Maybe I'll see you over there. You never know what's going to happen." Asked by a reporter if he wants to go, Trump said, "We'll be doing some interesting things." When asked: "Do you know when?" Trump responded, "I do, but I can't tell you." On Tuesday, Trump was asked as he departed the White House whether he was "afraid" to visit the troops in a war zone, after the Washington Post reported that a former senior White House official had said Trump was "afraid people want to kill him." He was also asked why he hadn't visited a war zone while president in an interview on "Fox News Sunday." 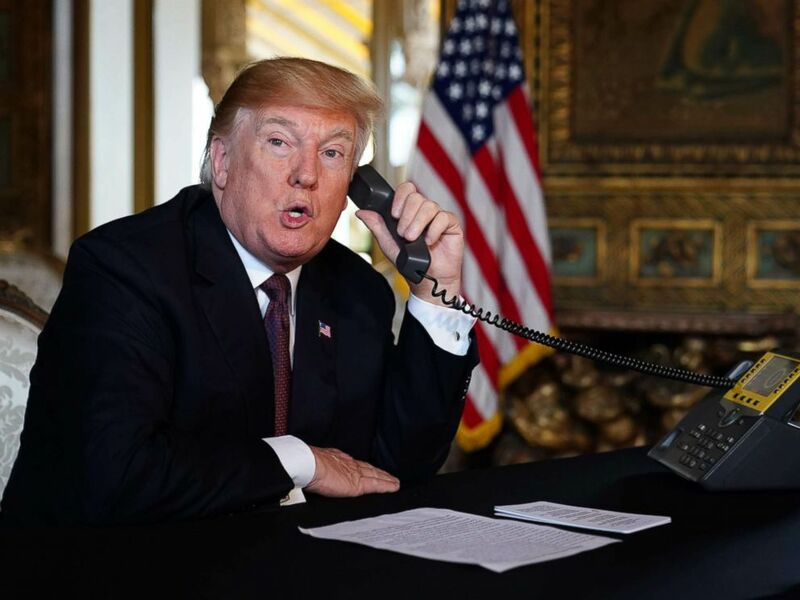 President Donald Trump speaks to members of the military via teleconference from his Mar-a-Lago resort in Palm Beach, Fla., on Thanksgiving Day, Nov. 22, 2018. Defense Secretary James Mattis said Wednesday he has advised the president not to go certain places at certain times. One year ago, Trump kicked off his first Thanksgiving as president with remarks to the troops via videoconference from Mar-a-Lago. He thanked them for their service and praised progress in the fight against ISIS, as well as the domestic economy and the “big, fat, beautiful tax cuts” on the way. 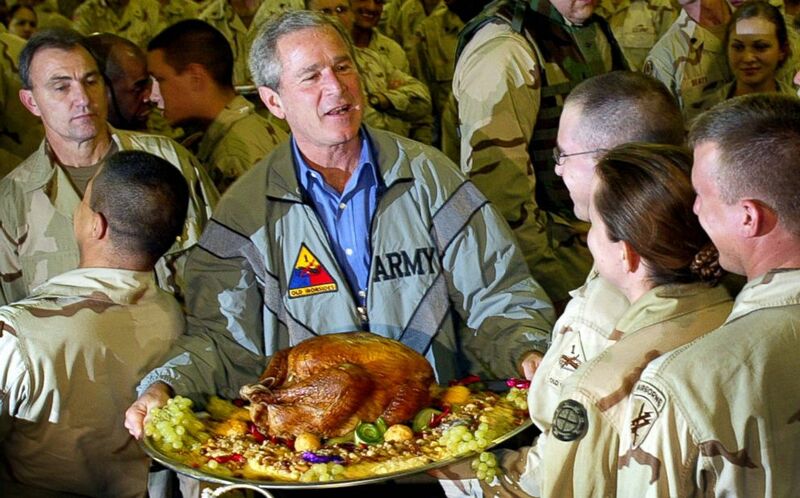 In 2003, President George W. Bush surprised troops in a war zone on Thanksgiving Day. That was 15 years ago -- the same year he deployed those troops to fight. President George W. Bush holds a Thanksgiving turkey for U.S. troops stationed at Baghdad International Airport on Nov. 27, 2003 in Baghdad, Iraq. It has not been done on a holiday since. Obama visited a war zone five times during his presidency and he did so within the first four months of his first term. 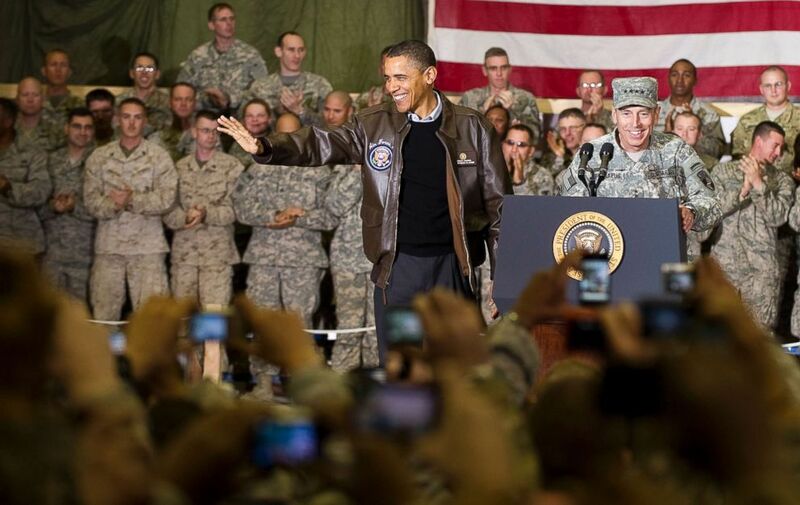 When Obama visited Iraq in April 2009, there were close to 140,000 U.S. troops in the country. He had campaigned on ending the Iraq war -- and during that trip, he officially announced a strategy for U.S. withdrawal. Today, there are 5,200 U.S. troops in Iraq. When Obama first went to Afghanistan in March 2010 he had just announced a surge of another 30,000 troops back to that forgotten, nine-year-old war. The number of U.S. troops in Afghanistan would grow to 100,000 later that year. Today, there are 14,000 U.S. troops in Afghanistan. General David Petraeus introduces President Barack Obama at Bagram Air Base in Afghanistan, Dec. 3, 2010 during the president's surprise visit for the holidays. There are also 2,000 U.S. troops in Syria.